Discontinued. 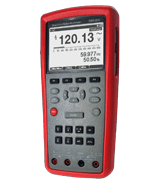 The SBS-600 is a True RMS industrial graphical digital multimeter and data logger with trend capture and analysis. It will quickly capture data with real-time logging and graphing capabilities and can store up to 10,000 readings with recall ability. This allows the user to recall past or recent readings without having to download the data to a laptop or PC. The large 3.5” display allows the user to zoom in on trends and view captured data. User-friendly PC integration software is easy to install and includes a USB cable to access real-time PC connection/data logging, or download to the software and export to Excel.